When I was a little girl, watching my abuelita and mami in the kitchen was like watching a flawless machine at work…but with cumbias and salsas, and a whole lot of chatting in the background. There, they would recreate recipes from Peru, all of which I would eagerly await to bite into later. 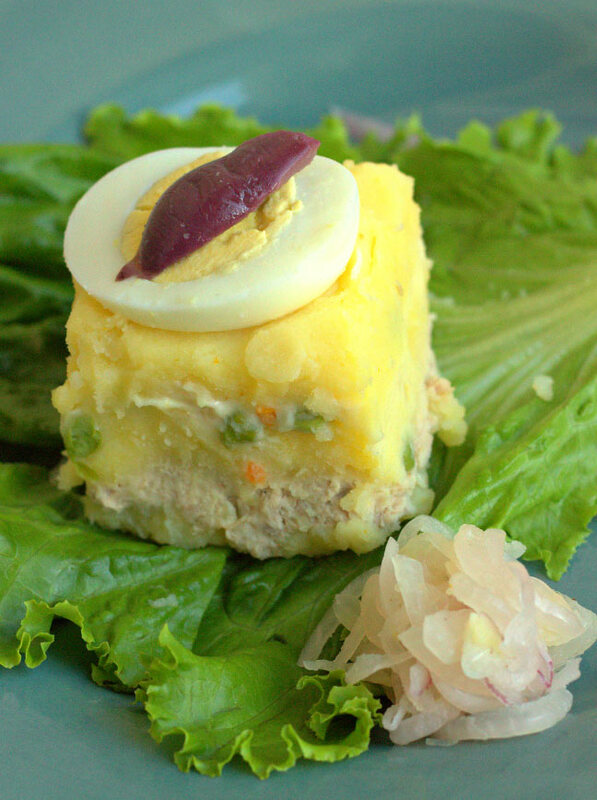 One of my favorite dishes was Causa Rellena, because depending on your serving size it could be lunch, dinner, an appetizer, or even a midday snack. It’s filling, tasty and full of Peruvian flavor that will always remind me of that kitchen of my youth. One of my favorite Peruvian dishes, passed down to me by my mami and abuelita...and now to you! Step 1: Boil the potatoes until they’re soft, about 30 minutes. Remove them when done. Step 2: Using my abuelita's trick, run the potatoes under cold water while they are hot, then peel (be careful). Step 3: Place peeled potatoes in a large bowl. Set aside. Step 4: Open tuna cans, drain them and place the drained tuna into a bowl. Add mayo, mustard, chopped onion, peas and carrots, and salt and pepper to the tuna and stir together. Set aside. Step 5: Add salt, pepper, the aji paste, garlic, 4 tablespoons of vegetable oil, and lime juice to potatoes. Mash the potatoes with the mixture and set aside. Step 6: In a rectagular Pyrex dish, flatten half of the mashed potatoes out in a even bottom layer. Spread the tuna mixture over the top of the potatoes and make it flat with a spoon. Layer with the remainder of mashed potato mixture and flatten with a spoon. Refrigerate until ready to serve. 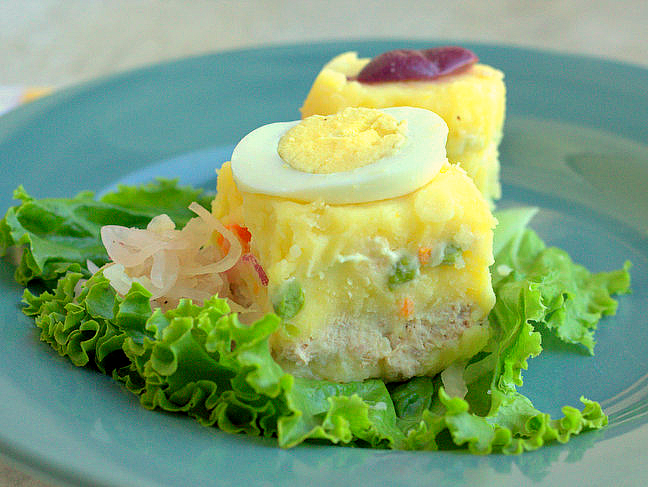 Step 7: Cut with a cake knife into squares and serve topped with egg and olive slices.